As with other games developed by Retro Studios, namely the Metroid Prime trilogy, Donkey Kong Country Returns rewards players with a series of extra content once they complete certain tasks throughout the game, such as collecting all Puzzle Pieces, defeating a world's boss, or beating the game on Mirror Mode. 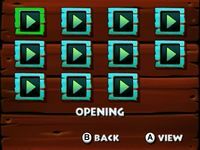 The optional content comes in the form of images, music, dioramas and (only in the Nintendo 3DS version) cinematic video clips, and can be accessed through the "EXTRAS" section of a game file. Dioramas are inanimate three-dimensional models logging various scenes from Donkey and Diddy Kong's journey on Donkey Kong Island, starting with the Jungle and ending with the Volcano. Each diorama is based on one of the eight main worlds; the conditions to unlock it are defeating the boss and collecting all Puzzle Pieces from the Key Temple level of that world for the first time. Unlocked dioramas can be viewed in their appointed gallery, and can be rotated and zoomed in or out. 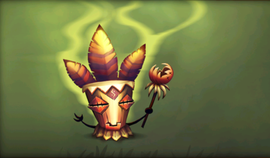 Bonus Gallery – contains miscellaneous artworks; to unlock the entire gallery, Tiki Tong must be defeated. Rows detailing concepts that were either partially used or had undergone significant changes are in white, and sections of completely discarded ideas are in light gray. Tiki Tong Storyboard Short storyboard for the game's post-final battle cutscene. Donkey Kong is blasted through the Tiki Tong Tower, and as the tower looks up perplexed, it is suddenly squashed by the Moon, brought down by DK. Scurvy Crew The members of the Scurvy Crew pose in a tower formation. A notable difference from this artwork during the game is that the positions of the blue and orange crabs in the tower are switched, while Cap'n Greenbeard keeps his top position. Ship Attack! Scene of a naval conflict between several galleons, occuring near land. Donkey Kong, swinging on a rope, narrowly avoids a cannonball that is damaging a ship spar. The artwork is enclosed by a darkened ring edge, creating tension and a unique atmosphere. Undersea Adventures An underwater scene that captures Donkey Kong riding a red Dunkleosteus through a submerged forest. A school of piranhas swim in the opposite direction, in front of a spindly trunk. 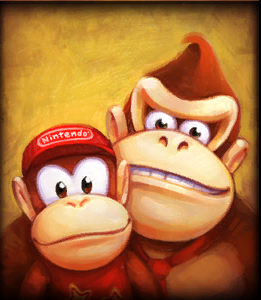 Donkey Kong has a thin snorkel pipe in his mouth, even though he never uses one while swimming in other games. Ferndozer The natural environment around an industrial area is being ravaged by a Ferndozer. Only a vast terrain of cut tree trunks, among red pipes and girders, has been left behind after the deforestation. Three other Ferndozers can be seen on a ridge in the far background. Factory Entrance The entrance to a factory in the middle of a forest, producing a bulk of studded barrels. The factory appears to be branded under the name "Barrel &/or Barrel", which is displayed at its top. A system of red pipes converge into the building, which is built out of pieces and components that are reminiscent of NES hardware. 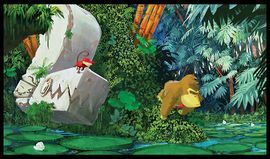 The artwork also contains an homage to the arcade Donkey Kong — a large reconstruction of Mario's sprite from that game is inlaid within the eastern wall. Hut Exterior Donkey Kong standing in front of his hut, located in a wide open space within the jungle. The house is built on stilts and raised high above the ground, being reachable via a bouncy tire on the left. Another tire acting as a swing lies hanged from a palm tree on the right. A fuming volcano appears on the skyline behind the dense green jungle. Mole Carts Sketch of two moles popping out of minecarts and taking Donkey Kong by surprise. 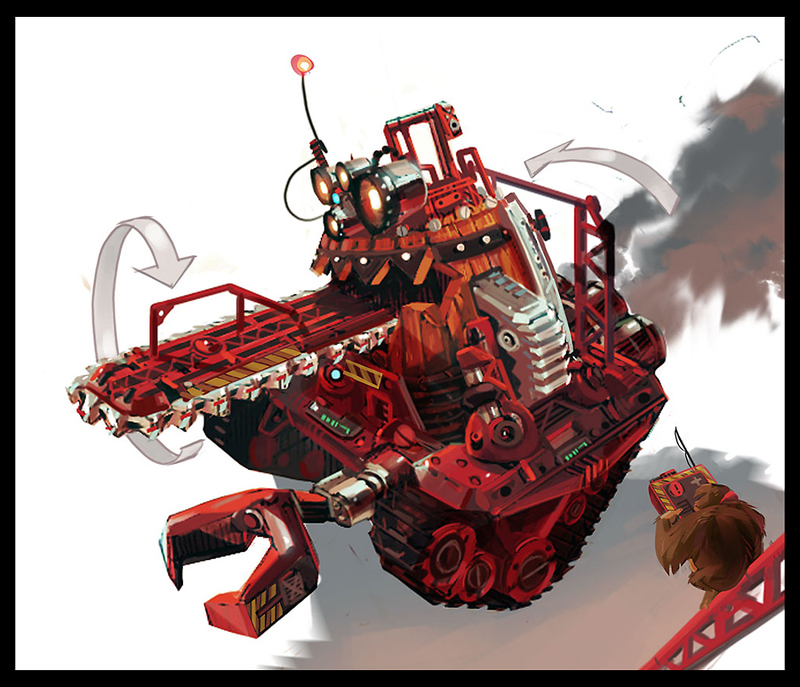 Mole Miners with this behavior are found and fought during the Mole Train boss stage. 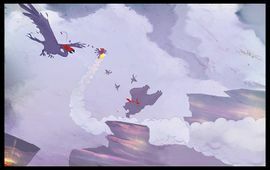 Steamy Adventure The Kongs are chased by an enormous red-headed vulture through a misty cliffside. Diddy soars on his jetpack and tries to hold off the enemy with his Peanut Popguns, while DK is on the ground, running away and leaving some banana peels behind. This concept is not integrated in the game. Volcanic Ascension The Kongs ascend a volcanic slope, on the background of a steaming crater and blackened ashes. Columns of volcanic steam also rise towards the horizon, in tandem with an erupting volcano over a clear, blue starry skyline. 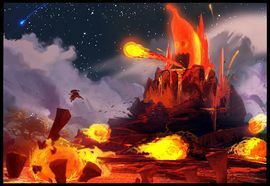 Along with other concept artworks (Volcano Eruptions and Angry Banana), this illustration might have been one of the preliminary concepts used for the Volcano world. Banana Coaster Giant banana landforms risen above a forested area. A coaster is entwined around several of these bananas, leading into the background. The picture suggests that the final level would have contained a Mine Cart sequence. Paper Cutouts Envisagement with a cutout aesthetic. The layout is similar to that seen in the first Golden Temple artwork, featuring a starting point (barring any gateway), a girder platform, floating bananas and a continuing ground. The setting appears to be a beach, with a grove of palm trees located next to it, under a clear sky. Wacky Blocks An erratic dimension reminiscent of the Mushroom Kingdom, whose elements, disorderly arranged around stout trees and vines, are based on various objects from Super Mario Bros. 3, such as colored blocks, Grass Land bushes, and spotted mushrooms. Pudding Wonderland A sky world with enormous banana summits emerging from pudding-like clouds. Wafers in both flat and stick shapes form a pathway above the clouds. One of the wafer sticks has a cherry on top. The wafer sticks are present in the final rendition of Golden Temple as platforms, although the scenery in the image as a whole only tangentially resembles the level. Virtual Boy Tracks Dynamic picture with Donkey Kong on a Mine Cart track, avoiding a shooting fireball. The image has Virtual Boy-inspired visuals, something that is not integrated in the final version of the game. Golden Temple The altar inside the Golden Temple, consisting of an Aztec pyramidal structure that holds a light-shedding Golden Banana. The roof is decorated with palm trees and grass. Donkey Kong can be seen beating his chest near the Golden Banana, which appears to be smaller than its final appearance. Close to the pyramidal structure, there are two smoking columns rising above the chasm. The walls of the surrounding ravine display reliefs of apes dancing around the altar. Crackers and Pudding A sweet-themed world with hills made out of pudding, bananas and cookies coated with whipped cream. Temple Entrance Donkey Kong placing the Rare Orbs onto the gate that opens the Golden Temple. Temple Exterior The exterior of the Golden Temple, located on a mountainous platform just as in the game. However, compared to its final appearance, the area surrounding the temple appears to be narrower and devoid of any vegetation. Beach Bridge A natural bridge arching around a bright seaside scenery. A running DK prepares to cross it, while two big crabs await him there. Stubby stalactite formations hang from the underside of the bridge; similarly, there are stalagmites further ahead, to the left. The game does not present a similar layout or decoration in any of its levels, although a Beach world inhabited by crabs exists in the game. Eel Fight Donkey and Diddy Kong, engaged in a battle with a huge moray eel monster wrapped around a lighthouse. The monster has two crossed patches on the side of its head, where it is possibly supposed to be hit. DK appears in several instances throughout the picture, climbing and attacking the eel, while Diddy appears only once, fighting the eel with his Popguns while hovering with the barrel jet. Neither the fight nor the eel itself are incorporated in any form in the game. Amber Tracks A long railtrack cutting through a colossal amber cavern, seen from a low perspective. Prehistoric arthropods are trapped inside the amber walls. The track leads into a glowing orange area located past the fossil chamber. 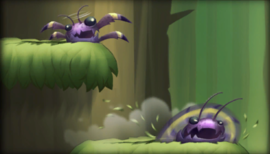 This environment does not appear in the game, but the prehistoric and mine cart themes present in Prehistoric Path, a level in the Cliff world, might have been carried over from this concept artwork. Bopapodamus A Bopapodamus perched on a wooden pole, in front of a pale green background. Tree Top Village A lush village built in the heights of a redwood forest and a possible homage to some levels from the original Donkey Kong Country. Homes are carved into tree trunks and are surrounded by circular footpaths. Numerous stairways, bridges and ropes weave between houses, with torches affixed to them. Multiple decorations, such as bells and wind chimes, hang from ropes. Houses and torches light powerfully, but the area is otherwise gloomy. This area in particular is not explored in the actual game, but it is remotely similar to various areas in the Forest, especially those that contain suspended houses. Dusky Cliffs A serene cliff scene at twilight. Close to the observer is a boardwalk illuminated by a few torches, as well as rock walls with large ammonite remnants surrounding the area. 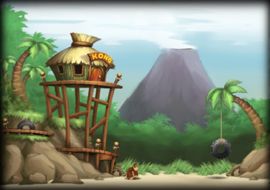 Donkey Kong and Diddy Kong are resting on an elevated platform on the right side. The backdrop is a landscape with rugged crags, marked by riggings of ropes and wooden balconies. The central crag hosts a cluster of strange big drums, as well as an obscured ichthyosaur fossil underneath. The sky, albeit a calm shade of blue, seems to be cloudy, with a few light beams coming from cloud ruptures. Sceneries like in this artwork are common in the Cliff section of the game, and most of them are cloudy as well, though none take place at dusk. Old School A compact array of constructions based on NES and SNES components and controllers, creating an "old school" feeling. The area shares the location with a forest peeking its vegetation in several parts and is likely related to a previous concept artwork, Factory Entrance, depicting an early look of the Factory world. Angry Banana Dynamic scene of an "Angry Banana" towering a lava land and spitting large balls of fire. The hill upon which the banana stands sinks into a lake of magma, spread with unstable stone pillars. One of them is toppled by a swooping fireball—Donkey Kong can be seen leaping from it. As in other artworks related to the Volcano, the sky is starry and contrasts with the glowing red scenery; however, a significant part of the back plane, including a small patch of vegetation, is obscured by thick clouds of smoke. Temple Monument Artwork of a monument that resembles the four statues around the Golden Temple, though seemingly much bigger. It looms over an area with dense vegetation, in front of a clear skyline flown by birds. Patches on its surface layer reveal that the statue is made out of gold. It has been suggested that audio and/or video file(s) related to this article be uploaded. Part of the game's soundtrack is available in the music gallery, which contains eight music sets linked to one of the eight main worlds of the game. A set can be unlocked by defeating the boss of its corresponding world. 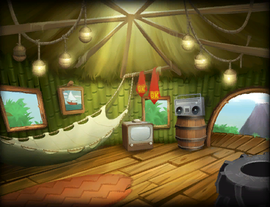 The movie gallery allows the player to rewatch the game's cutscenes and is exclusive to Donkey Kong Country Returns 3D. Movies can be unlocked by collecting Puzzle Pieces in the first eight levels of the Cloud world, which is also exclusive to the Nintendo 3DS version. This page was last edited on February 17, 2019, at 18:17.